LAS VEGAS – Bob Arum has a plan, or at least he thinks he does, that can finally get Floyd Mayweather and Manny Pacquiao in the same ring instead of continuing boxing's most infuriating standoff. In between highly lamentable comments with borderline racist undertones, Arum laid it all out in the clearest of terms. 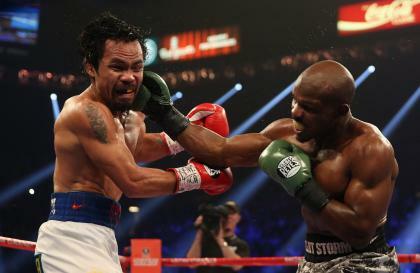 "The only people that can make Floyd Mayweather fight Manny is the public, if they boycott the nonsense on May 3," yelled Arum at the press conference following Pacquiao's unanimous decision victory in his rematch against Timothy Bradley. He was referring directly to Mayweather's next fight, against Marcos Maidana in three weeks' time, for which Maidana is a heavy +750 underdog. "That's what the public should do. [If the media] want that fight, tell the public not to buy pay-per-view and not to buy tickets. There is no other [strategy]. We are prepared tomorrow to sit down at a table with his people … to work out the conditions for the fight." Mayweather and Pacquiao have circled each other for years and as long ago as 2009 it seemed as if a showdown between the fight game's two biggest would be made. When the bout fell apart, it was not entirely clear who was ducking whom, though time has told us that Mayweather has been wiser to avoid the clash. Every demand he has made, from enhanced drug-testing to a greater profit share, has been accepted by the Pacquiao camp, but still no agreement has been made. Arum has recently steered clear of criticizing Mayweather but was incensed this week by seeing countless banners and signs promoting the Maidana date around the MGM Grand property, right in the middle of his own attempts to amp-up publicity for the Pacquiao-Bradley rematch. That prompted him to go on a series of acerbic attacks, first of all on MGM management, and finally, after Pacquiao's comprehensive victory, on Mayweather and his advisors. For the most part, it was entertainment – the sort of verbal vitriol that boxing has thrived upon for years. Sadly, however, the rant included this veiled – and likely unintentionally racist – rip against Mayweather. "Write all you want about 15-1 fights with no-hopers and all this thuggery," Arum said ringside, conveniently doubling the actual Maidana odds to emphasize his point. "We'll give you quality fights. HBO will give you quality fights. But you want to close your eyes to thuggery in this sport." When Seattle Seahawks cornerback Richard Sherman was described as a thug following his outburst about San Francisco 49ers rival Michael Crabtree after last season's NFC championship game, it sparked an intense national debate about the appropriateness of the word's usage to describe a black athlete. When challenged about his repeated use of the word and asked whether it was appropriate, Arum completely dodged the question. "The ring is square," he said. "The rules for conducting a prize fight are immutable. There are no real issues." While Pacquiao was meting out his personal version of poetic justice for a poorly scored 2012 fight against Bradley, Mayweather was a few miles away relaxing in a hot tub with a bunch of female admirers – at least according to his Instagram account. Yet, apart from the question of why exactly he needed a fire pit by the jacuzzi when it was 82 degrees outside, the nagging question of why he won't fight Pacquiao is hopefully one which will reach his ears soon. Unfortunately for Arum's agenda, a mass boycott of Mayweather's bout would do more harm than good. But fans of the sport deserve the right to see the two shining lights of this generation in combat at last, even if it is half a decade after it should have first happened. Arum wasn't exactly slick with his delivery and his "thuggery" comments deserve criticism, but he is on to something here. Mayweather is called "Money" for a reason, and for as long as the public keeps swallowing up the one-sided snoozefests he serves up, brilliantly technical though they are, he will happily accept the minimal-risk paychecks for as long as they present themselves. A dismal PPV buy on May 3, albeit unlikely, may spark a shift in mindset, for him and the executives at Showtime, who inked him to a six-fight deal of which Maidana will be the third. Boxing is full of talk and talkers. Some of it is fun, some of it is babble and some of it is just plain out of line. Let's hope that something, namely the matchup boxing is desperate for, comes out of this night, which otherwise will have been nothing more than a bunch of hot air overshadowing a strong Pacquiao performance.